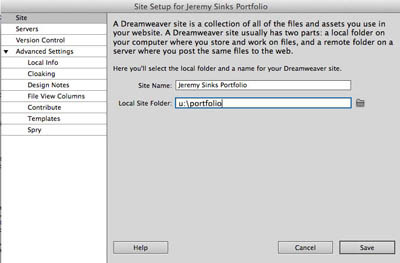 In Dreamweaver, it's important to define a site so Dreaweaver knows where to look for all the files associated with a site. Dreamweaver has a nice feature that warns you if you've moved a file or changed a file name, and will even automatically update pages with links associated with that file to reflect the current file name. IMPORTANT – Dreameaver stores the site information on the local disk of the computer, so if you MOVE to another computer, you will need to REDEFINE the site. The site information DOES NOT follow you. 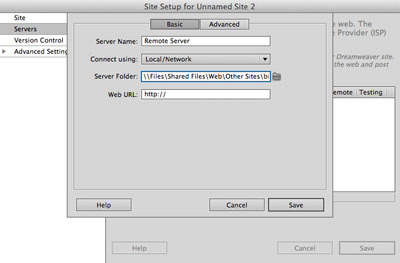 Click the drop down arrow next to the Connect Using box and change the connection from "FTP" to "local/network"
In the next exercise, you will learn about Cascading Stylesheets and set up an external stylesheet to style all the pages in your portfolio.